Did you manage to read about the love triangle that Hubby mentioned in his ode? When he read up to that part, I could sense many in the room holding their breath. Why on earth would he talk about a love triangle, and about my not being his first love in an ode? What’s more, he was doing this is a Marriage Enrichment Course! The facilitators must have thought they made a ghastly mistake to let Hubby do this bit! To add to it all, they could see me smiling and nodding away in agreement to this love triangle! Odder and odder! Well, in his next sentence, Hubby explained. 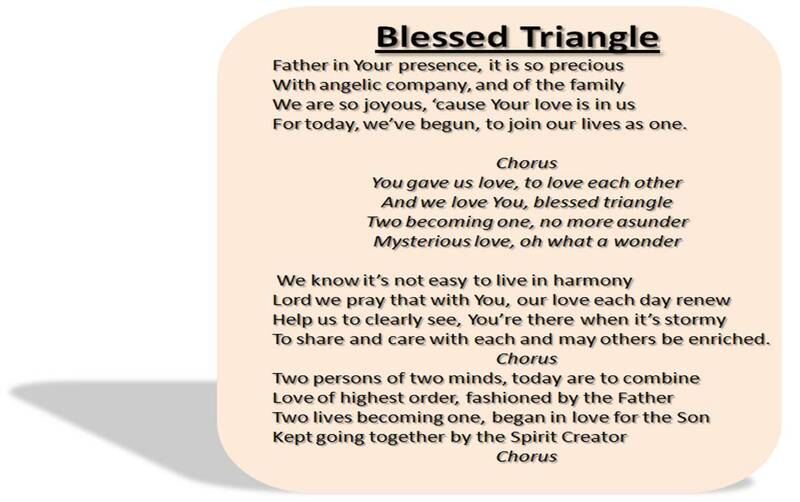 It was in reference to the song we wrote for our wedding called Blessed Triangle, where we promised each other that our love would be a triangular affair – God had to be at the apex, and the both of us at the base. As we drew near to God, we would naturally draw near to one another, as in any equilateral triangle. Voila. Here are the lyrics to the song. This entry was posted on 16/01/2011 at 08:02 and is filed under Event, Family, Fun, Gifts, Personal. You can follow any responses to this entry through the RSS 2.0 feed. You can leave a response, or trackback from your own site.